Of course, night was fast approaching—the sky was growing darker and fading into an ominous sapphire. It struck me as a cliché damsel-in-distress situation best saved for bad movies. I sat still and listened carefully for any sounds suggesting my rescue, but the air remained silent. I found myself glancing again at the Sandia Mountains, following the clouds as they drifted slowly across the dimming sky. I’d always admired them. Tall, majestic, a vast expanse of life and growth. A good place to go hiking as well, which I’d done many years ago. 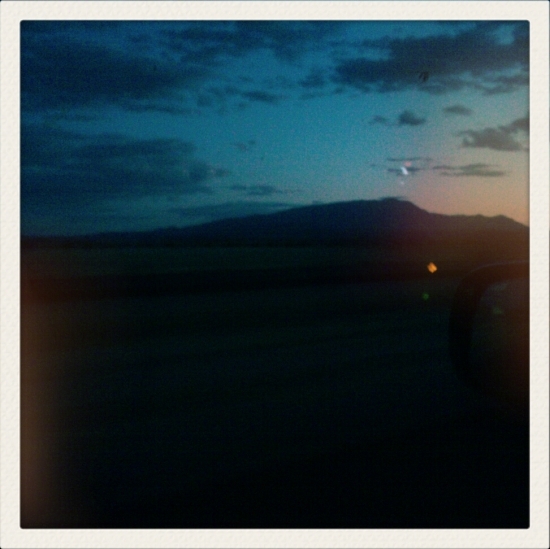 However, the Sandias didn’t seem as inviting at this time of night. Their dark presence was intimidating, and their emerging aura of gloom was giving me the creeps. The familiar chills began, but they subsided quickly as I forced my thoughts elsewhere. What was I waiting for? I could get down without their help. I tried to adjust myself, but I quickly realized my big hips weren’t going to let me down without a fight. I couldn’t get a solid grip on anything. In all honesty, I had chickened out about jumping down long before the guys left. I’d just have to wait it out on the hoop and concede defeat. A few minutes later, uneven footsteps began to resonate distantly from the shadows. I peered into the darkness as I searched for the source. Trepidation aside, I wanted to slap the living daylight out of whichever one of them it was. But as the figure drew closer, I realized it wasn’t either of the guys. The approaching body was too thin to be Toby’s and too tall to be Sean’s. The figure was surrounded by intense darkness, which disappeared as it stepped into the fading light. The dude was grungy and taller than I’d expected, with a square, angular face. Shadows drew emphasis to his high, sunken cheekbones and the large purple bruise covering the lower left half of his face. His black shaggy hair stuck up wildly and clung to his face. He wore a thin black t-shirt and ragged, ripped jeans. It seemed like he was living rough; the guy was emaciated and covered in dirt. Although his face was emotionless, his bright, hauntingly blue eyes pierced through mine and told me everything I needed to know – something wasn’t right about him. He looked like a total drugged-out creepo.